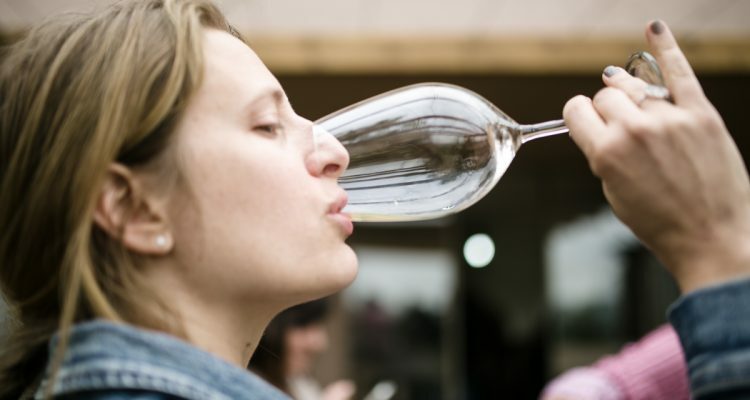 Is there a “right” way to drink wine? I’m not sure. But there are wrong ways. Some might want to deny this because we don’t want to be exposed as wine snobs. But the prevailing American culture around wine is far more prescriptive than that. The food media constantly tells us wine must go with food. A flotilla of wine appreciation schools teaches us to swirl and sniff and distinguish Chardonnay from Sauvignon Blanc while blindfolded. I googled “How to drink wine” and came up with a variety of helpful instructions. The first tip in the first link explained, “a proper glass will make any wine taste better,” and provided a chart of 18 different kinds of glasses. Then I got a 10-part process on tasting wine, with photos. Don’t forget step 3, “Note the wine’s viscosity.” Must I? His point was that red wine is a TV prop for women, and might be used to denote power. But the redness wasn’t Asimov’s only point. Is there a right time to drink wine? A correct way to hold the glass? A proper consumption rate? Part of me wants to say no. I’ve been known to grab the “bowl” myself. (I’m pretty sure “bulb” was a vocabulary error, and besides a gentleman never grabs the bulb in public.) I usually swirl and sniff at the beginning, but after the first few sips, not so much. It’s America, I’m tempted to say. Go ahead and drink Screaming Eagle out of the bottle. Better yet, pour it on your date’s chest and lick it off. I love a note of salinity in wine. What a country. This is the easiest, most populist position. A lot of the prescriptiveness of wine culture bothers me. I’ve probably had 500 bottles of wine since the last time I noted a wine’s viscosity. But at the same time, recently at a trendy restaurant near my house I ordered a glass of Tempranillo Blanco and was disappointed when it was served in a water glass. I wouldn’t want to say there’s a “right” glass for Tempranillo Blanco — I’d only had one in my entire life — but to me, that was the “wrong” glass. So I’m going to wade into this. I’m not going to tell you the “right” way to drink wine because I don’t think there is one. It especially gets under my skin when writers claim wine shouldn’t be drunk without food when I’ll bet more than half the wine in the U.S. is consumed that way, and why not? If it tastes good, drink it. This is OK at home alone, but don’t do it with other people’s wines. Happens all the time on the Internet, and is probably the most obnoxious thing wine writers do. You like Rombauer Chardonnay? Moscato? Super Tuscans? Sweet! Another glass? This happens a lot. People order or buy something, dislike it, but slug it down because they feel they must. Life’s too short to drink bad wine. Dump it or push it aside and get something else. If you just need the alcohol, order a Martini. If you’re trying to impress us with your wealth and taste, you’re only going to succeed at half.